Construction and real estate has been a booming sector in India, which is facing a major slowdown in the aftermath of demonetisation. It has always been a sector riddled with litigation owing to multiplicity of taxes and dual administration mechanism; thereby exposing it to the conundrums of both Central and State levies. Currently, certain activities in this sector command a cumulative tax levy on effectively 140% of the actual transaction value owing to cascading effect. Further there are long standing issues which have not been concluded till date. Availability of Input Tax Credit for Construction of Immovable Property: Under the current tax regime, Cenvat Credit on inputs used for construction of a building or a civil structure or any part thereof is restricted, however, the Cenvat Credit of input services and capital goods is permitted. It is imperative to mention here that Section 17(5)(d) of the Central Goods and Services Tax Act, 2017 (“CGST Act, 2017”) restricts the Input Tax Credit (ITC) of goods (inputs and capital goods both) and input services only in the event when the goods and services are being used for construction of an immovable property (other than plant and machinery) by a taxable person on his own account including construction of such immovable property for furtherance of business. Therefore, it can be inferred that ITC is not restricted when goods and services are being used by a taxable person in the same line of business. Hence, under the GST regime builders/ developers would be eligible to take ITC on inputs which was earlier restricted. Increase in cost of property: The Hon’ble Supreme Court in the case of K Raheja Development Corporation vs State of Karnataka (2005) 141 STC 298 (SC) upheld by the larger bench in Larsen & Tourbo Ltd vs state of Karnataka (2013) 65 VST 1 (SC) para 101,Para 115 of the said order clarified that activity of construction undertaken by the developer would be works contract only from the stage the developer enters into a contract with the flat purchaser. The value addition made to the goods transferred after the agreement is entered into with the flat purchaser can only be made chargeable to tax by the state Government. However, this is overturned in the GST regime by virtue of clause 5(b) of Schedule II in which it is mandatory to pay the entire consideration after occupation or completion certificate to avail exemption from GST. 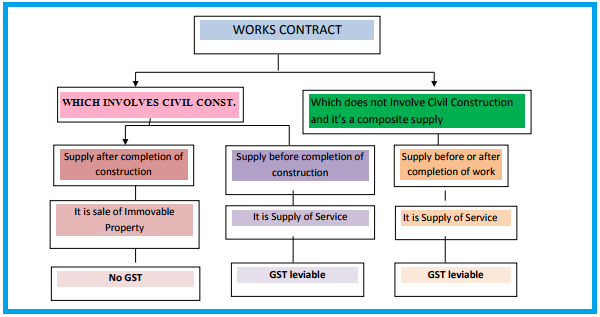 Meaning thereby in the construction linked payment cases GST is leviable on the full value of sale irrespective of the stage of construction status. Impact on working capital in case of supplies from unregistered persons: If the registered person purchases goods or procures services from any unregistered supplier then as per Section 9(4) of the CGST Act, 2017 he would be required to pay GST from his own pocket under reverse charge mechanism in a month and would be eligible for ITC on the same in next month. a) Transfer of land development rights by the landowner to the builder/ developer: - TDRs being a benefit arising from the land, thus the same shall be considered as a benefit arising out of an immovable property as defined under Section 3(26) of General Clause Act, 1987, therefore the same is neither taxable under the Service Tax Law nor taxable under VAT regime. Now, as per entry no. 5 of the Schedule –III to the CGST, 2017, only sale of land and building is neither supply of goods nor supply of services. Thus, it needs to be clarified by the Government whether the benefit arising out of such land and building would be covered under the ambit of entry no. 5 of the Schedule –III to the CGST, 2017.
i. from landowner, in the form of land/development rights:- In this case the builder/ developer has already received the consideration in the form of transfer of development rights prior to the issuance of completion certificate by the competent authority, therefore the same is taxable under Section 66E of Finance Act 1994.
ii. from other buyers:-In this case, if the builder/ developer receive any consideration prior to the issuance of completion certificate by the competent authority, then the same is taxable under Section 66E of Finance Act 1994 and if the entire consideration is received after the issuance of completion certificate by the competent authority, then the transaction is not taxable. In the GST Regime, the provisions pertaining to the taxability of TDRs are in pari-materia with the current law, therefore TDRs would be taxable as explained herein above. Under GST regime, the definition restricts Works Contracts only in relation to immovable properties. Such contracts are expressly stated as services under Schedule II of the CGST Act, 2017. Currently, no abatements or exemptions have been notified in this respect. The value of taxable supply shall be transaction value except in case of supplies to related persons where valuation rules shall be applied. In the absence of such tax exemptions and concessions, there is a possibility of a significant increase in project costs. Reversal of ITC under Works Contract: If the builder has a project in which there are 1000 flats. However due to market conditions or for any other reason he is able to sell only 800 flats till the time he receives the completion certificate. In this case, he will have to reverse the credit taken on the balance 200 units as upon receipt of completion certificate, these flats would become building and would be covered under entry no 5 of schedule III of the CGST Act, 2017. In this scenario, he may be liable to pay interest on such reversal of credits for the period starting from the date of completion certificate till the date of actual reversal at the prescribed rates. There may be various receipts which the builder usually receives from its customers like transfer charges, holding charges, cancellation charges, legal charges for registration purpose etc. These receipts are taxable under GST. There is one welcome provision in the GST Law that the criteria for taking credits of taxes is made enlarged and liberalised. Now all input and /or input services which are used or intended to be used in the course of furtherance of business, credit of taxes charged on such input / input services would be available without making any correlation with the output supply. This change will help increase the business efficiencies and cost effectiveness. Under clause (d) and (e) of subsection (5) of section 17 of CGST Act, 2017, a supplier who construct the building, flat, dwelling unit, independent floor or shop etc. either through works contractor or on his own for the purpose of letting out / leasing for consideration, will not be able to take any credit of taxes charged on input and input services used in the construction of such buildings, flats etc. due to specific restriction. Though letting of these building etc. for commercial purpose is taxable but benefit of input tax credit is not extended which is against the principal of Value added based tax. It will results into increased cost of constrictions and higher rents of such commercial properties. Section 140 of the CGST Act, 2017 provides for transitional provisions in relation to credit of eligible duties in respect of inputs held in stock or inputs contained in semi-finished or finished goods held in stock on the appointed day. furnished by him under existing law. 3. credit shall not relate to goods manufactured and cleared under such exemption notifications. goods, not carried forward in a return not furnished by him under existing law. special category of person including works contract or construction activity. or service provider engaged in taxable as well as exempted activity both. Refer point no 1 and 3 above. a) If the goods or services are being supplied on or after the appointed date in pursuance of the contract entered prior to the appointed date, then tax would be levied under GST. b) If the goods or services are supplied before the appointed date and VAT was leviable on such transaction on account of Sale of goods or Service Tax was leviable on account of provision of services, no tax will be required to be paid under GST. c) If the consideration has been received prior to appointed date in respect of such supply and tax has already been paid under current regime, no tax would be required to discharged /paid under GST. d) If any VAT and Service Tax has been paid on any supply under the existing laws, but the supply of goods and/or services is to be received under GST scheme, then the tax already paid shall be allowed as credit under GST and the supplies when made shall be taxed under GST as well. This clause covers specifically works contract transactions. For example: If an invoice is raised on 30th June 2017 and the supply is for the month of June 2017 and July 2017 and VAT and Service Tax have been paid, then such VAT and Service Tax paid shall be allowed as credit in GST proportionate to the month of July 2017; and when supplies are made in July 2017, they shall be put to tax under GST. The above radical change in Indirect Taxes will surely foster the ideology of GST i.e. one nation- one tax. However, concerns remain w.r.t the taxability of TDRs when the development rights are being transferred to builder/ developer and seamless credit availability of ITC to a constructor/ developer/ works contractor. There is a pressing need for the Government to look into these issues in more detail to avoid any ambiguity which might affect the economic environment of the country.